LADA XRAY has comfortable and high seating, especially convenient in the city and light off-road. ESC function is responsible for vehicle's active safety. electronic brakeforce distribution (EBD) efficiently distributes efforts between axles thereby preventing drift. Passive safetyEach LADA XRAY has airbags for driver and passenger, front seatbelts with pretensioners and load limiters. LADA XRAY equipped with ISOFIX system and rear doors blocking system to make travel for young passengers safe and comfortable. Safe vehicle is the vehicle which is seen on the road. 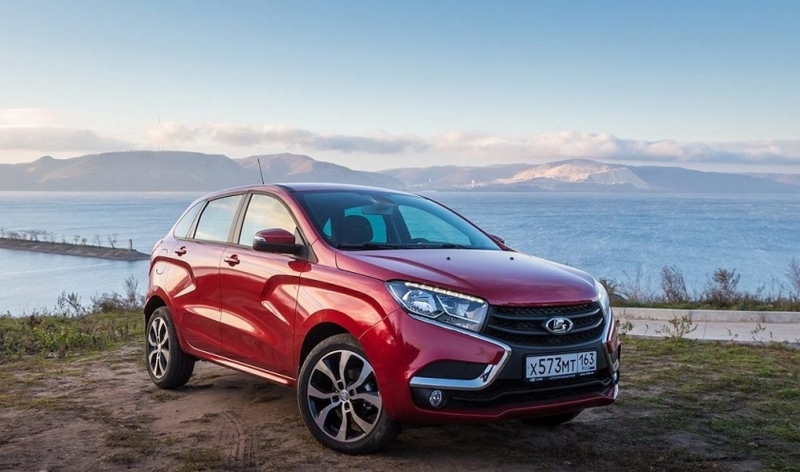 LADA XRAY will never gets lost in the flow, thanks to bright LED day-running lights. LED strip contributes to the style by lighting chromed front X.
plastic trims and rubber seals for sills: reliable insulation against soiling. EnginesThree options for powertrains allow selecting LADA XRAY in accordance with own need for dynamics. Engines of 106 h.p. are equipped with manual transmission while the most powerful 122 h.p. engine is equipped with automated manual transmission (AMT). TransmissionAMT combines functionality of manual and automatic transmission and is designed for Russia, that is why its performance is not affected by outside temperature. AMT has full functionality of manual gearbox, including engine braking and possibility to get out of snowbank by "pitching". Unlike all other variants of transmission, ATM saves fuel, prolongs vehicle's service life, and moreover it is more affordable than other automatic transmissions. Vehicle’s interior is comfortable and rational. Cabin has range of niches and cup holders, pockets in door trim, pull-out container right before the front passenger, cooled glove box. Trunk has mounting for net and plastic niches behind rear wheel arches. Double floor in trunk compartment and folded seats make even area, thereby making transportation of cargo of all shapes and sizes easier. Backseat folds in proportion 60/40 thereby allowing to move big-size cargo.